Sunrise on the road from Cedar City to Bryce Canyon. A very cold (-15 °C) morning in Utah, USA, April 2003. The moon on the road from Cedar City to Bryce Canyon. Bryce Canyon, Utah, USA, April 2003. Balanced rock and the Manti-La Sal Mountains, Arches National Park, Utah, USA, April 2003. Delicate Arch, Arches National Park, Utah, USA, April 2003. Landscape Arch, Arches National Park, Utah, USA, April 2003. Navajo Arch, Arches National Park, Utah, USA, April 2003. Double-O Arch, Arches National Park, Utah, USA, April 2003. Cannon Beach, OR, April 2001. Sunset at South beach, Newport, July 2001. South Beach is our first stop on a round-trip down the Oregon coast to California, Mt Shasta and back to Crater lake and Oregon. Near Coos Bay, July 2001. On our way to California. On Fremont Bridge, driving home, Portland, OR. Terry Robb at the "Portland Bite", sunday 19th on waterfront, Portland, OR, August 2001. Usually you can see him at the Candlelight in Portland. Cup & Saucer on SE Hawthorne, to start the day with a good breakfast. The Crystal Ballroom on Burnside. R.L. Burnside recorded on of his LPs there. Jazz de Opus, no cover, music everyday. Jimmy Mak's on NW Everett. Stephanie Schneiderman plays there every now and then. The Ohm. Dahlia every Tuesday. The Freightliner Headquaters in Portland, OR. My (former) working place, Corp 1. The view from my appartment in Sunset Summit ,SW Portland, OR. I lived there for approx. 3 month before moving to SE Morrison. The Big Obsidian Lava Flow with the Cascades in the background, Newberry Volcanic National Monument, OR, May 2001. Obsidian is a dark mineral that is a variety of glass. East lake at Newberry Volcanic National Monument, OR, May 2001. At this time of the year the place was nearly empty. Weather conditions were a lot better then in Portland confirming that going east of the Cascade is a almost certain way to find blue skies. At Smith Rock State Park, OR, looking upstream. Central Oregon, looking for "Thundereggs" with my 85 Plymouth Caravelle, June 2001. The sign on the left reads "Don't give up". The Sisters and Mt Bachelor from Pine Mountain some 60 miles away, OR, June 2001. On the summit of Pine mountain there is an astronomical observatory (Link to it's website) and a few campsite. Volunteers let you look through the telescopes pointing at various stars and supernovae. It is definitely a good idea to stop here on a trip from Portland to eastern Oregon . Suddenly the John Day river heads north trough a canyon marking the entrance in the John Day Fossil Beds area, OR, June 2001. We are coming back from eastern Oregon and are on our way back to Portland. A white-barked pine (I think, dead, I think), at the Crater Lake rim, OR, July 2001. Road are rare in eastern Oregon, when you see one take a picture of it. This one leads to Frenchglen, June 2001. The plan was to drive to Frenchglen and to camp there, but on Memorial Day everything was packed. Light and shadow, the Donner und Blitzen Valley from Steens Mountain, OR June 2001. Bad weather and crowded campgrounds prevented us from overnighting on Steens mountain. We went to the Diamond Craters instead. 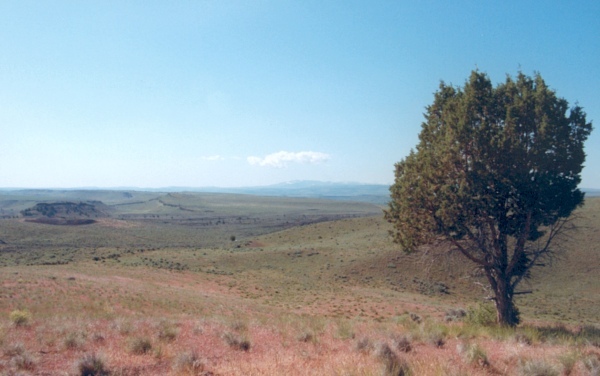 Leaving the Burns-Malheur area, driving north towards the Strawberry Mountains, OR, June 2001. The mirages are caused by the variation of the refraction index of air with temperature. As a light beam approaches the (hot) ground it is "curved" by this varition of the air properties. The observer "sees" the sky on the ground when a curved light beam from the sky seems to originate from the ground. Additionnal turbulence creates a shimmering effect that makes it look like water...The limitation of the light beam "bending" limits the mirage to a far distance. The city of John Day, OR, June 2001. From now on the trip continues in central Oregon. View from the Coldwater Ridge at the Mt St Helens Volcanic National Monument, March 2001. On the Left the Visitor Center. Camping in California, while some take pictures of themselves, other are (supposed to be) gathering firewood...that's teamwork. We do look like a happy and united team, don't we? Vallejo street, San Francisco, CA. An electrical nightmare. Wolfgang H. at Pine Mountain, OR, June 2001. With Mount Hood in the Distance, we are on our way to eastern Oregon. Wolfgang H., Sebastian W. and me camping in California, while some take pictures of themselves, other are (supposed to be) gathering firewood...that's teamwork. We do look like a happy and united team, don't we? That's me at.... San Francisco. The black Dodge Neon we drove to Vancouver and Olympic National Park. Good car (especially chassis) except for the gearbox. The world famous purple Neon. Don't blame me, I am not driving.